The blogging world is a very busy one, and I used to quickly chat to Kerry occasionally on Twitter, but it wasn't until the passing away of her daughter Rihanna that we really connected. 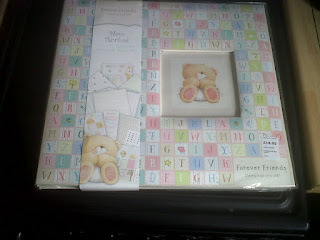 Kerry is a very talented scrapbooker and I am pleased she has shared about the importance of memory keeping. Picture the scene, the sun is shining, the bags are packed and the picnic is ready. You pile your children into the car, all laughing and smiling and at your happiest, your partner gets in beside you starts the car and your journey to the beach begins. It doesn’t take you long, until you are finally there, finding a spot on the beach. Unpacking your stuff, putting sun cream on the children and getting ready for the day ahead. The children are laughing, running around, playing and having great fun. They are in the sea, out of the sea, eating, jumping around and getting your all involved in everything they are doing. It is a great day, one that has resulted in lots of fun, and lots of memories, things that you will never forget. You don’t need to take photos of the day; they are all in your head. Making you smile just remembering them. You don’t need to scrapbook them, why would you? Everything you created today will last a lifetime. Your child was born and spent the first few months in hospital and everything that was happening to you was a complete and utter blur? What if even worse than that, like us you don’t even get those months in hospital? We had a few precious hours with our little girl, she was born sleeping. So in just hours we had to create enough memories for myself and her father to last a lifetime. But as well as our own memories, we had to create enough moments, for her big brother (who at three was too young to see her), her grandparents, aunties, uncles, cousins and for any future siblings she will have to share with us as well. We didn’t have long, and we had to remember everything important about her. We took photos, we took lots. But that wasn’t her full story. Her story started six months previous to this. It started when we first found out we were pregnant, her story was not just about the few hours that we spent with her and we needed to record all of her memories. We decided to create a scrapbook for her. Scrapbooking isn’t just about sticking photos into an album; it is about creating your story. Our little girl had a story, she had her little life and her scrapbook tells all of it. We have included notes of our feelings when we found out we were pregnant, the dates that we went for checks. What was said by the midwife and how we felt throughout the pregnancy. It will tell the upsetting story of us finding out, and her birth, yes they are not happy events, but they are still her events. Yes at the moment they are still not included, they are too hard to write. But they will be in there as that is her story and they will be followed by all of her pictures. There are 40 in all. Not a huge amount, and probably should have been more. But everything was a complete blur, now three months on, we can work out what happened and at what time, it is all important, it all defines her and it is all going in her scrapbook. But it isn’t even just about the facts and figures. We had over 100 messages of support when we told people our news. Everyone has been copied, and printed out and they will all be put in her scrapbook. Her life may have been short but it affected lots of people and she touched so many hearts and we both want her brother and family to know how many lives she touched. All of these things are important to making her alive and remembering everything about her. The support will be in the album, pride of place showing how much she was loved. Her memories don’t stop there. We have pictures of things we do to remember her, events that we will do in the future to raise some money and pictures of the things we have brought her. Scrapbooks are places to record the important things in your lives, and to keep all your memorabilia and photos in one place. Imagine once again, your eldest child is in their twenties and they ask you about their sister, the angel in their lives. They want to know how it felt, the dress that she wore and who held her first. What if you couldn’t quite remember the answer, what if it had slipped your mind. You will never get that back. However if it was all in a scrapbook it would never be forgotten the truth would never be lost, and your little girl will always be looked at and loved dearly through her scrapbook. Maybe next time do take that camera, put them in the scrapbook at the end of the day and sit there and write about how special your children made you feel today, how much they made you laugh, and how it was a fantastic day all getting on and having fun. Write the truth let them know exactly how you felt as in years to come, this book, those moments, those feelings will mean everything to your child and their children. So make sure your memories can be passed on and on forever and ever! Well I am Kerry, in 2005 I met Mr L and we quickly moved into together and in 2008 we had Baba. I started blogging in 2009 when I first started my writing course. I wanted somewhere to write about all the things that Baba did, and how we coped as a family with Mr L working every hour under the sun, and I working from home, looking after a little one. In 2011 I set up my own Scrapbooking business, Scrapbookerry which has gone from strength to strength in the first year and is having lots of new products and services added regularly. In November 2011 we found out we were expecting our second child and in March 2012 we found out that it was a little girl at the 20 week scan and our family was complete, or so we thought. Unfortunately Rhianna Lily passed away and was born sleeping on the 23rd March 2012. Our lives have changed dramatically, and my blogging has changed dramatically, but the love we all have for each other and my passion for my business and my passion to get everyone in the world scrapbooking has only grown and increased. It is so important that everyone records everything in their lives, some memories only last moments, but they affect us for ever and should never be forgotten but should be passed on and on. I just got a check for $500. So I show them a video of myself getting paid over $500 for paid surveys to set the record straight.